During the heyday of railway travel, people believed trains would be with us for centuries. Engineers floated many futuristic train ideas, and some were even realized, before automobiles took over. Here are some of the craziest trains ever conceived. The Vitznau-Rigi Railway, Switzerland, had standard gauge rack fitted vertical boilered locomotives. The system was patented in 1863 by Niklaus Riggenbach. The steam-powered straddle-beam monorail named Meigs Elevated Railway, invented by Josiah V. Meigs in 1886. The inventor wrote an explanation of how the system works, published it in 1887 and built a 227 ft (69 m) demonstration line in East Cambridge, Massachusetts, but nobody wanted to adapt the technology. The small line ran until 1894. The Holman locomotive with too many wheels, built by the Philadelphia-based Holman Locomotive Company in 1887 as a lure in a stock-market swindle. The Lartigue Monorail system, developed by Charles Lartigue. The first Lartigue-system monorail line was built in 1888 in Ireland, and another in 1895 between Feurs and Panissières, France. The Boynton Bicycle Railway, operated between 1892 and 1894 on Coney Island. The inventor, M. E. Boynton claimed that a speed of one hundred miles an hour can be obtained with this system. 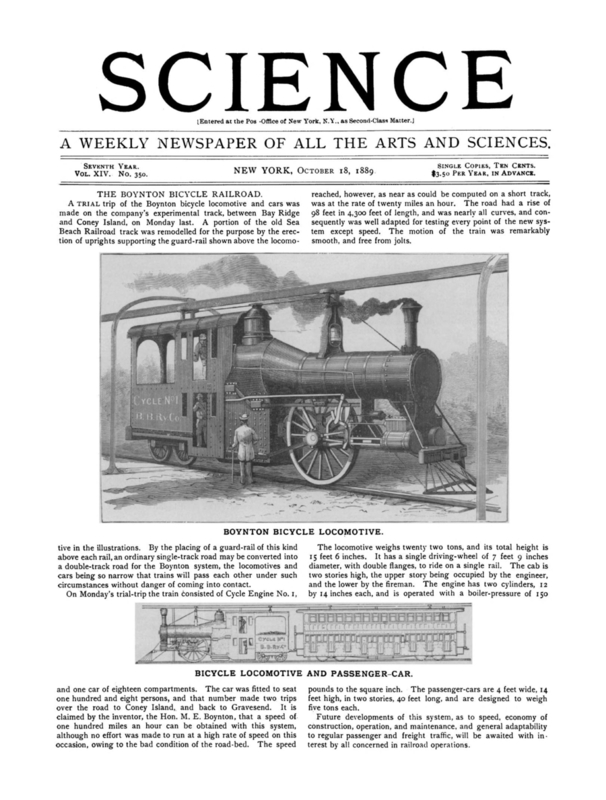 The car was fitted to seat 108 people, according to Science Magazine, October 18, 1889. The Chase-Kirchner aerodromic system of transportation, with some wings, a concept from The Coming Railroad, an 1894 book written by George Nation Chase and Henry William Kirchner. The wind-powered system with electric engines which could reach the speed of 125 mph was never built. Brennan's monorail, a system invented by Louis Philip Brennan CB, patented in 1903. After two small demonstration models, (a 2ft 6 in by 12 inch one in 1903 and a 6 ft by 1 ft 6 in one in the next year) Brennan built the first working railcar in 1909, that could carry 32 people around the factory. The model had a 20 hp petrol engine and could reach the speed of 22 mph (35 kmh). It used a pneumatic servo and electric transmission. The system was used on the Japan-British Exhibition in London, 1910 where it carried 50 people at a time around a track. The idea never found backers—but if it had, the public might be enjoying futuristic monorail travel through the air between Burbank and downtown. In 1910 inventor J.W. Fawkes built a propellor-driven aerial trolley that he claimed would haul passengers at speeds up to 60 miles per hour. To demonstrate, he hung a quarter-mile-long overhead track in his Burbank apricot orchard and invited passengers aboard. Dubbed the Aerial Swallow, the trolley was about 40 feet long and powered by a Frankline air-cooled engine, which turned the propeller. But the prototype topped out at three miles per hour, and investors kept their hands in their pockets. The experimental high-speed railcar with an aircraft engine named Aerowagon, invented by the Latvian-born Valerian Abakovsky, constructed in 1917. Only one prototype was built. Four years after its completion a group of communists took it to test it between Moscow and Tula. On the return route to Moscow the machine derailed, killing five people and the inventor on board. The German Schienenzeppelin (means Rail Zeppelin), the prop-driven V12 locomotive, developed by Franz Kruckenberg in 1929. The Schienenzeppelin was powered by a 46-liter BMW V12 engine and a massive propeller, which helped to reach the unbelievable 143 mph per hour (230.2 kmh) in the summer of 1931. Only one prototype was built, which was dismantled in 1939. Is it a plane? Is it a train? No, it&apos;s a prop-driven V12 locomotive!